(a) Using a precision straightedge and feeler gauge, check the surface that is in contact with the cylinder head gasket for warpage. If the warpage is more than the maximum, replace the cylinder block. 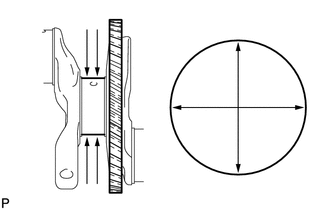 (a) Using a cylinder gauge, measure the cylinder bore diameter at positions (A) and (B) in the thrust and axial directions. 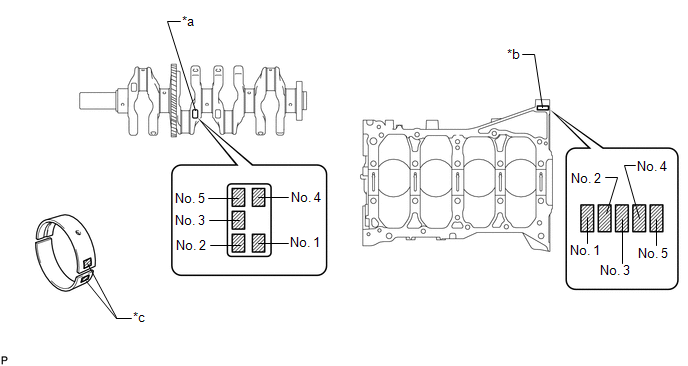 If the average diameter of the 4 positions is more than the maximum, replace the cylinder block. 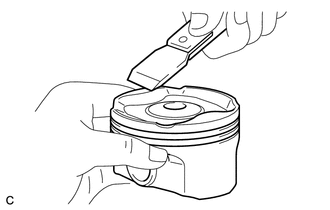 (a) Using a gasket scraper, remove the carbon from the piston top. (b) Using a groove cleaning tool or a broken ring, clean the ring grooves. (c) Using a brush and solvent, thoroughly clean the piston. 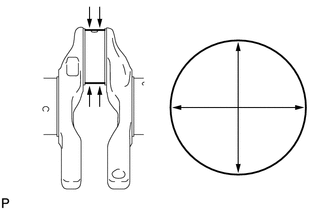 (d) Using a micrometer, measure the piston diameter at a position that is 10.5 mm (0.413 in.) 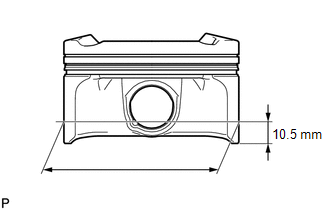 from the bottom of the piston (refer to the illustration). If the diameter is not as specified, replace the piston. 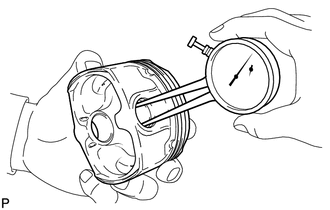 (a) Measure the cylinder bore diameter in the thrust direction. 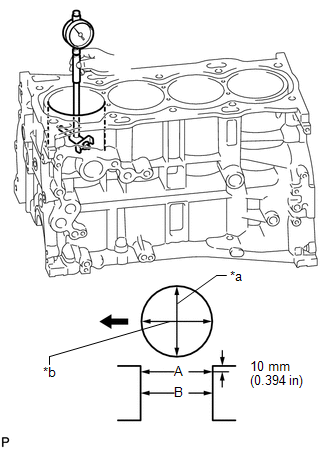 (b) Subtract the piston diameter measurement from the cylinder bore diameter measurement. If the piston oil clearance is more than the maximum, replace all the pistons. If necessary, replace the cylinder block. (a) Using a feeler gauge, measure the ring groove clearance between the new piston ring and the wall of the ring groove. If the ring groove clearance is not as specified, replace the piston with pin. 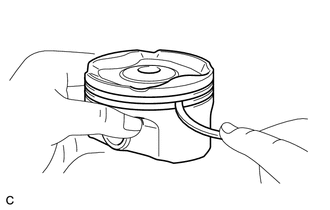 (a) Insert the piston ring into the cylinder bore. 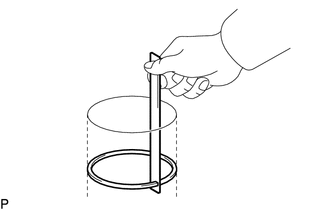 (b) Using a piston, push the piston ring a little beyond the bottom of the ring travel, 120 mm (4.72 in.) from the top of the cylinder block. (c) Using a feeler gauge, measure the end gap. If the piston ring end gap is more than the maximum, replace the piston ring. If the piston ring end gap is more than the maximum, even with a new piston ring, replace the cylinder block. (a) Check each mark on the piston, piston pin and connecting rod sub-assembly. The front mark is "1L" printed in raised letters. 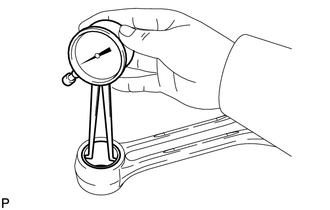 (b) Using a caliper gauge, measure the inside diameter of the piston pin hole. (c) Using a micrometer, measure the piston pin diameter. If the diameter is not as specified, replace the piston pin. (d) Using a caliper gauge, measure the connecting rod sub-assembly small end bush inside diameter. If the diameter is not as specified, replace the connecting rod sub-assembly. (e) Subtract the piston pin diameter measurement from the piston pin hole inside diameter measurement. If the oil clearance is more than the maximum, replace the piston and piston pin as a set. (f) Subtract the piston pin diameter measurement from the connecting rod sub-assembly small end bush inside diameter measurement. If the oil clearance is more than the maximum, replace the connecting rod sub-assembly. If necessary, replace the connecting rod sub-assembly and piston pin as a set. 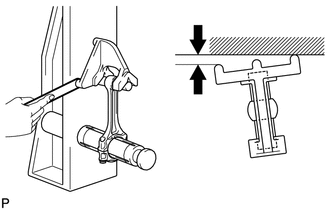 (a) Using a connecting rod sub-assembly aligner and feeler gauge, check the connecting rod sub-assembly alignment. 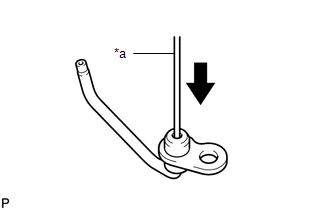 If the bend is more than the maximum, replace the connecting rod sub-assembly. 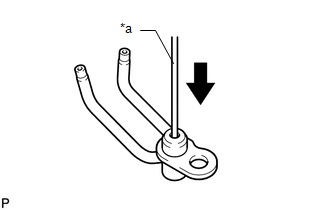 If the twist is more than the maximum, replace the connecting rod sub-assembly. (1) Place the crankshaft on V-blocks. 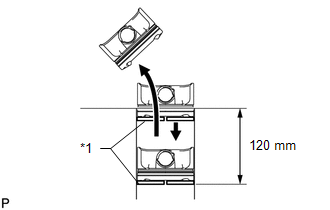 (2) Using a dial indicator, measure the runout as shown in the illustration. If the runout is more than the maximum, replace the crankshaft. (b) Inspect the main journals. (1) Using a micrometer, measure the diameter of each main journal. If the diameter is not as specified, check the crankshaft oil clearance. If necessary, replace the crankshaft. (2) Check each main journal for taper and out-of-round as shown in the illustration. 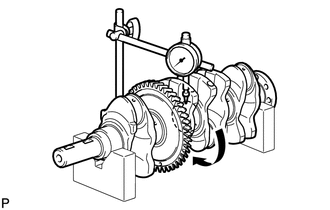 If the taper or out-of-round is more than the maximum, replace the crankshaft. (c) Inspect the crank pin. (1) Using a micrometer, measure the diameter of each crank pin. 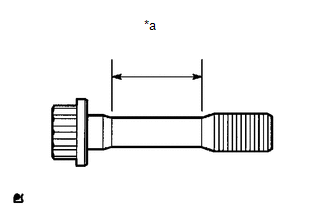 If the crank pin diameter is not as specified, check the connecting rod sub-assembly oil clearance. If necessary, replace the crankshaft. (2) Check each crank pin for taper and out-of-round. (a) Install the crankshaft bearings (See page ). 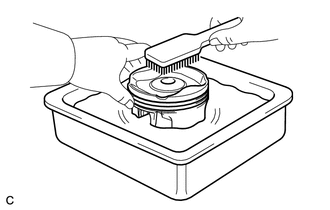 (b) Install the crankshaft thrust washers (See page ). (c) Clean each main journal and crankshaft bearing. (d) Place the crankshaft on the cylinder block. (e) Lay a strip of Plastigage across each crankshaft main journal. (f) Install the crankshaft bearing caps (See page ). (g) Remove the crankshaft bearing caps (See page ). (h) Measure the Plastigage at its widest point. Remove the Plastigage completely after the measurement. If the crankshaft oil clearance is more than the maximum, replace the crankshaft bearings. If necessary, replace the crankshaft. If replacing a crankshaft bearing, select a new one with the same number. If the number of the crankshaft bearing cannot be determined, calculate the correct crankshaft bearing number by adding together the numbers imprinted on the cylinder block and crankshaft. Then select a new crankshaft bearing with the calculated number. There are 4 sizes of standard bearings, marked "1", "2", "3" or "4" accordingly. 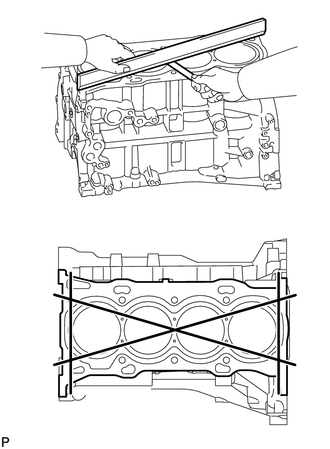 Cylinder block (A) "3" + Crankshaft (B) "4" = Total "7"
Select the bearing marked "3". (i) Perform the inspection above for each journal. 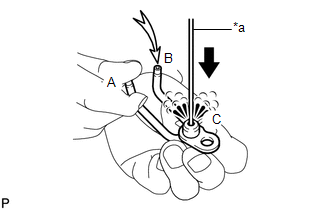 (a) Using a vernier caliper, measure the diameter of the bolt at the point shown in the illustration. If the diameter is less than the minimum, replace the crankshaft bearing cap bolt. Failure to do so may lead to engine damage. 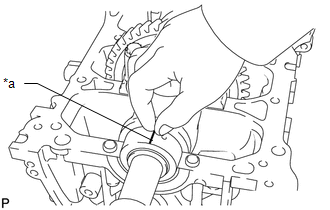 If there is any thread deformation, replace the crankshaft bearing cap bolt with a new one. 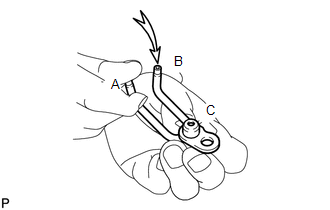 (a) Using a vernier caliper, measure the diameter of the connecting rod bolt in the area show in the illustration. 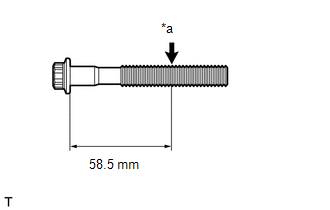 If the diameter is less than the minimum, replace the connecting rod bolt. Diameter measurements should be done at several points. If the diameter is less than the minimum, replace the connecting rod bolt with a new one. Failure to do so may lead to engine damage. If there is any thread deformation, replace the connecting rod bolt with a new one. 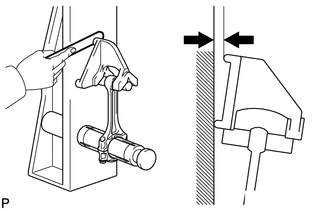 (a) Push the check valve with a pin to check if it is stuck. If stuck, replace the No. 1 oil nozzle sub-assembly. 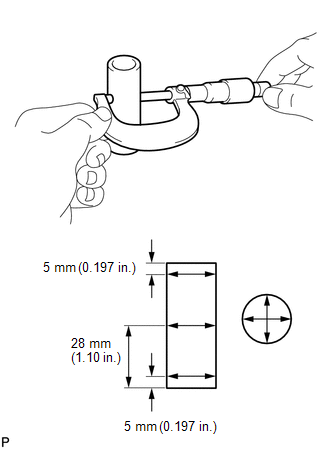 (b) Push the check valve with a pin to check if it moves smoothly. If it does not move smoothly, clean or replace the No. 1 oil nozzle sub-assembly. (c) Apply air into (A). Check that air does not leak through (B). If air leaks, clean or replace the No. 1 oil nozzle sub-assembly. 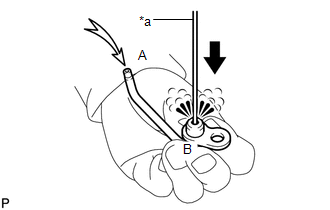 (d) Push the check valve while applying air into (A). Check that air passes through (B). If air does not pass through (B), clean or replace the No. 1 oil nozzle sub-assembly. If stuck, replace the No. 2 oil nozzle sub-assembly. If it does not move smoothly, clean or replace the No. 2 oil nozzle sub-assembly. 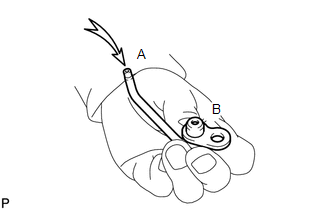 (c) While covering (A), apply air into (B). Check that air does not leak through (C). Perform the check again while covering (B) and applying air into (A). If air leaks, clean or replace the No. 2 oil nozzle sub-assembly. 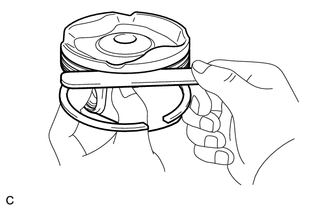 (d) Push the check valve while covering (A), and apply air into (B). Check that air passes through (C). 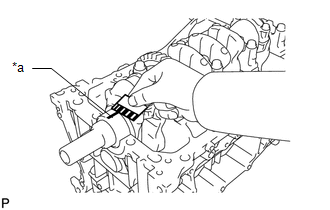 Perform the check again while covering (B), pushing the check valve and applying air into (A). If air does not pass through (C), clean or replace the No. 2 oil nozzle sub-assembly.